On the 23rd of June 2016, the UK votes on whether or not to 'leave' the European Union and regain full control over its own affairs instead. At least, that's how the argument is put by those in favour of the move. For humdrum workers in industries that actually import or export products or materials to the EU, it only means higher tariffs and complicated paperwork. For bosses it means increased costs and uncertainty – and reduced investment. But for one group, it does indeed promise a splendid new dawn of 'freedom'. This group is the super-rich, and they work in financial services in the City of London. For them the battle lines with the EU were drawn after the crash of 2007/8 which so nearly collapsed the entire Western banking system. The response, apart from pouring billions of taxpayer dollars, euros and yes, British pounds into the pockets of the injured speculators, was increased regulation. And so the dirty secret, as I see it, of Brexit is the financial services industry jockeying for 'lighter touch' regulation. But this issue has not been given prominence - instead we have talk about conventional business, trade flows, workers rights and currency rates. A constant complaint has been that EU laws are made by people who are unelected – which is simply not true. The real levers of power in the EU remain firmly in the hands of the national governments. But no one is interested in how the EU really works, they just want to stop the 'migrants'. The UK is obsessed with keeping out migrants. Indeed, waves of Somalis, Afghans, Iraqis and now Syrians are rather alarming – and certainly include a whole host of issues about conflicting social values. But what people mean by this is fellow Europeans. People who are better educated that the average Brit, and far more cultured, all they want to do is work hard and be useful members of the community. But many British resent or even hate them in just the same irrational way as uneducated whites hate people of colour. Because they're 'different'. This is why the British are such poor members of the Union, and if they vote themselves out of it in June, it will be this kind of nationalism that will have won it for 'Leave'. But giving 'the great unwashed' – the lower classes – this power is not usually done. Indeed the UK is primarily voting in a rare referendum because for decades leading the (ruling) Conservative party has been impossible without assuaging the demands of a noisy Europhile group. Even now, if the UK Parliament had an unencumbered vote, they would not hesitate but to continue working within the EU. In this way, the unelected bosses of the hedge funds and spread-betting firms who have been backing the 'Leave' campaign are driving the British where they want. 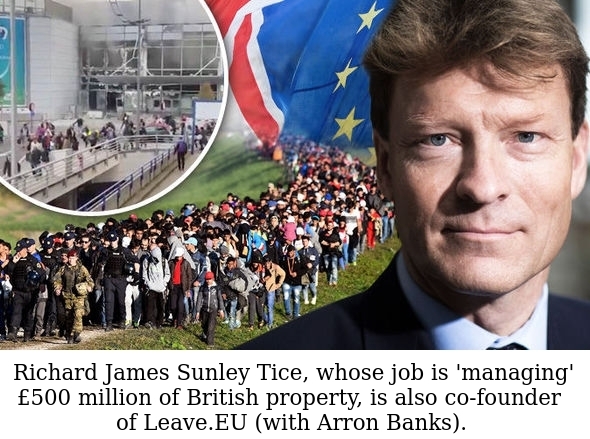 These are people like Richard Tice, co-chair of Leave; Crispin Odey, Peter Cruddas, a former Conservative Party Treasurer; Stuart Wheeler of IG; Michael Hintze, Conservative donor; not to entirely forget Edi Truell, Brexiter and again a major Conservative donor. For these city speculators – 'value trashers', in City jargon – the possibility of the pound plummeting, of share prices collapsing, of market and political dislocations with dire and unpredictable consequences – all represent big opportunities and easy money. Market disruption is excellent news for them, and so will any longer-term post-Br exit dislocation. And so, to sum up, the 'real story', as I see it, of Brexit is the worst elements of the financial services industry jockeying for 'lighter touch' regulation. It's the poachers tricking the rabbits into letting them be the gamekeepers. That means that a just a small sliver of the population—those with the most-deep pockets—have their thumb conspicuously on the scale, to advance their agendas. They can afford to underwrite and deploy their legions of proxies and surrogates, with loud megaphones. As John Adams lamented, in the context of his time, “the balance of power in a society accompanies the balance of property in land.” The result is a biasing of the system, buying access to sway individuals and institutions—especially fellow powerbrokers—to their cause. It’s a battle royal over who has leverage to shape the vision of the future. A battle waged between progressives and conservatives over ideas, as well as along other lines, such as between generations. Certainly, the overflowing coffers of the super-wealthy (the billionaire class in particular) don’t necessarily guarantee intended outcomes. Sometimes the money gets squandered, with attempts at swaying opinion and policy stumbling badly. The glide path isn’t always smooth. Such instances are well documented. But every time there’s a major political campaign, such as today’s billion-dollar-juiced race for the U.S. presidency, private ‘big money’ swings into action, whereby just a few individuals garner vastly disproportionate (and often conveniently veiled) influence. There are insufficient checks and balances to offset plutocratic passion, or to put social, political ideas to the test. The tenor of the debate can accordingly change dramatically. America’s founding generation was prescient in this regard. James Madison, for example, warned that unequal property ownership would pull the rug out from under liberty, either through opposition to wealth (a distrust of capital) or “by an oligarchy founded on corruption” through which the wealthy take the reins of political policymaking (a distrust of workers). I wager, Martin, there’s some of this in Britain, too—given your reference to the “unelected super-rich” swaying Brexit. I think your references to concerns of the US Constitutional 'Fathers' is very apt... and my own sense is that 'democracy' is entering its final cycle - with the process so skewed and perverted by special interests and the outcomes so vicious and divisive, that as Marx predicted (hoped indeed) collapse becomes inevitable. Unlike Marx I don't see any good successor system though. As far as the EU goes, I'm sure society needs the EU - actually the most democratic force the world has, by which I know I'm not saying much, so perhaps the Brits will do the wiser thing. If the whole business then prompts more care to the democratic deficit in the EU, then it would have been in a way useful. The reverse scenario starts with economic dislocation and resurgent nationalism and probably ends in tragedy. Capitalism needs more restraints. In fact, without even realising it, very many restraints already are in place. We tend to take it for granted: the abolition of slavery and child labour, the introduction of a raft of equality laws, social security legislation, and so on. All these, and much more, take precedence over the dynamics of an unfettered economics. Religions would seem to have understood it long ago: their “bottom line injunctions” are expansive. With regard to the EU, it was once the vision of a united Europe, after centuries of wars. This seems to have got lost in a blizzard of details.